The most reliable information on thermophysical properties of water and steam is provided by the International Association for the Properties of Water and Steam (IAPWS). The tables of these properties (for example [1, 2]) which are broadly used in industry, are based on equations certified by IAPWS. However, the electronic form of the tables is more suitable for obtaining this information. 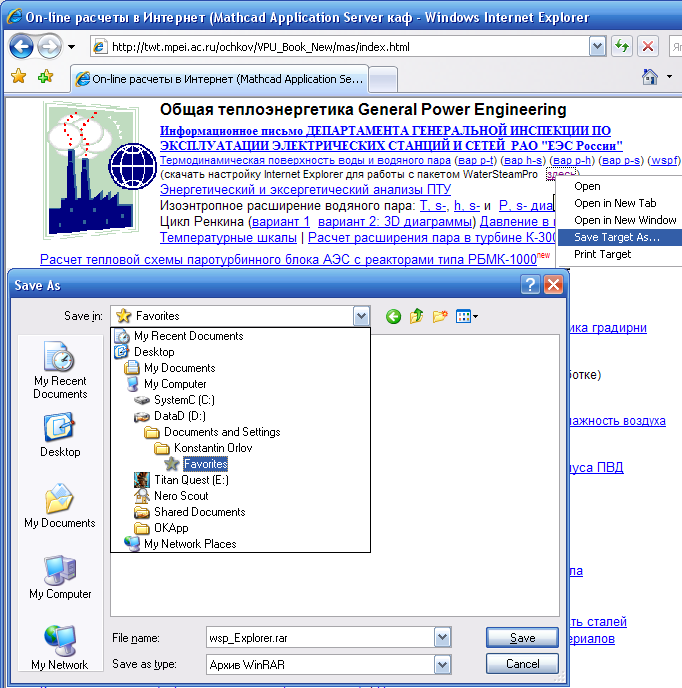 The special site http://twt.mpei.ac.ru/ochkov/WSPHB/Engindex.html was developed for this purpose. If one needs to determine values of steam properties, it is possible to use a reference book to get the result at once or possibly after interpolation of the table data. As an alternative, one may go to this site on the Internet. In that case one obtains the numerical value with chosen units and also a 2D or surface plot of the function. Besides, the on-line functions surpass the reference book, because the combination of input parameters is wider and it can be entered as any value within an acceptable range. The Internet permits downloading of functions in order to include them in the user’s program environment. 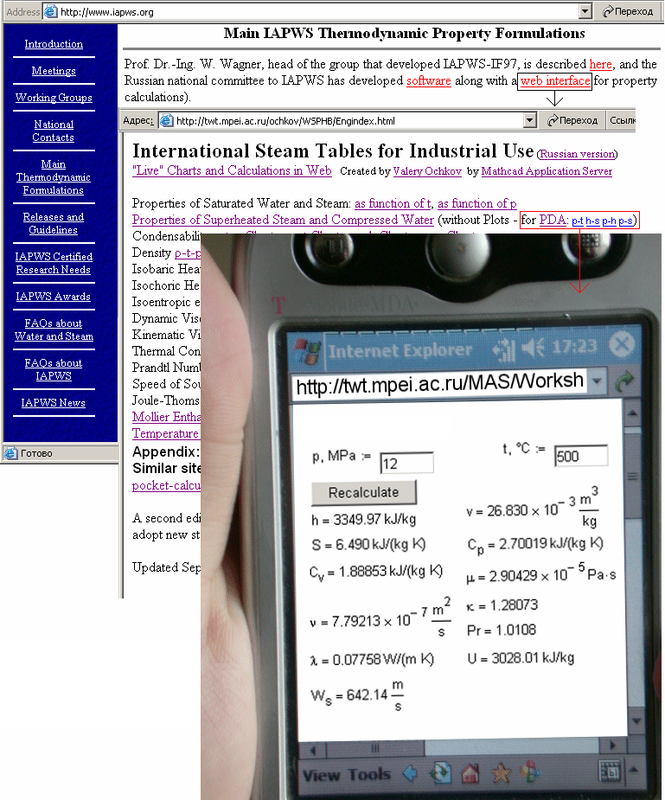 This article describes typical pages of the site; it points out how to upgrade a computer, or programs built into it, for operations with functions for determination of water and steam properties for thermotechnical calculations [3, 4]. Fig. 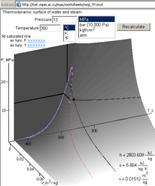 1 shows a page of the site (http://twt.mpei.ac.ru/MAS/Worksheets/wsp_Sat_P.mcd) with information about the properties of water and steam at the saturation line as a function of pressure. 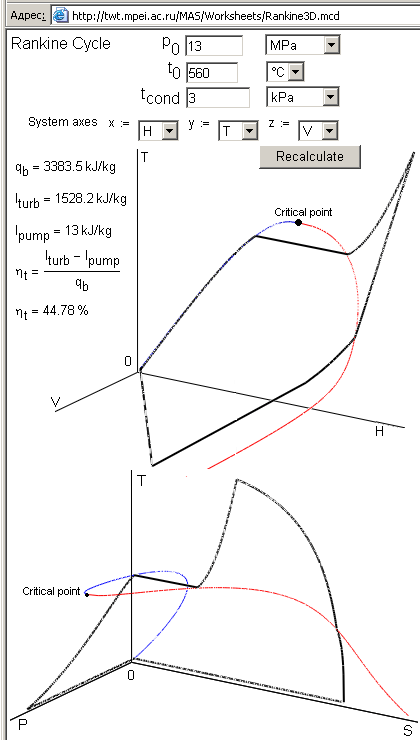 The pressure value may be introduced in different units (MPa, bar, atm, at, ksi) within the range from the triple point to the critical point. 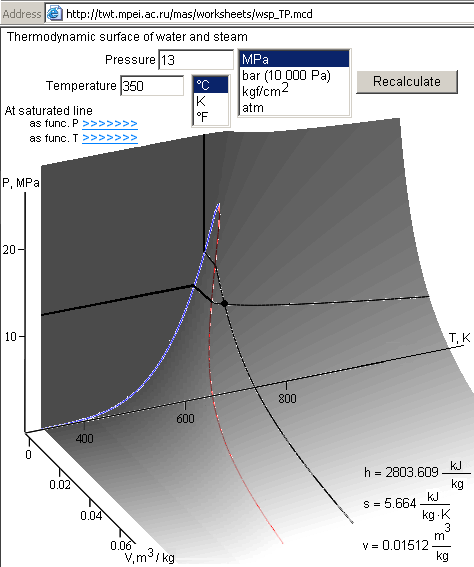 After clicking the Recalculate button, the program produces a plot and gives a numerical result for the required values – saturation temperature, specific enthalpies of water and steam, specific heat of evaporation (shown in Fig. 1), specific entropies, specific volumes, isobaric and isohoric specific heats, sound velocities, and Prandtl numbers (not shown in Fig. 1). For example, Fig. 1 shows that the enthalpy of steam at the saturation line has a maximum some left to chosen point – 40 atm. If it is necessary to obtain the properties of saturated water and steam as functions of temperature we should use the site shown in Fig. 2. (Here and below only the variable end of the site address is pointed – wsp_Sat_T.mcd). The structure of the site is the same as that shown in Fig. 1. We can enter the temperature in different temperature scales (Celsius, Kelvin, Fahrenheit). Fig. 3 shows a site (wsp_PT.mcd) containing the properties of water and steam in the single-phase region where values of pressure and temperature were entered. The point is fixed on the thermodynamic surface of water and steam which connects three parameters: pressure, temperature, and specific volume. This surface is supplemented with boundary lines and also with isotherm and isobar. Their crossing determines the required point. The calculated values are also represented in different units. This site contains hyperlinks to previous sites in order to get the parameters of the saturation state. The lines and surfaces shown in Figs. 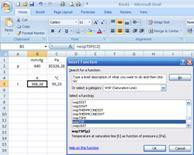 1 –3 supplement the calculation of single points and visually represent the behavior of some functions. These calculations considerably slow down data transfer on the Internet, load the server with additional work and considerably increase internet traffic. Taking that into consideration as well as addressing the needs of sites using pocket computers which have limitations of display size, the special “lightened” pages were created. One of them is shown in Fig. 4 (wsp_PS.mcd). 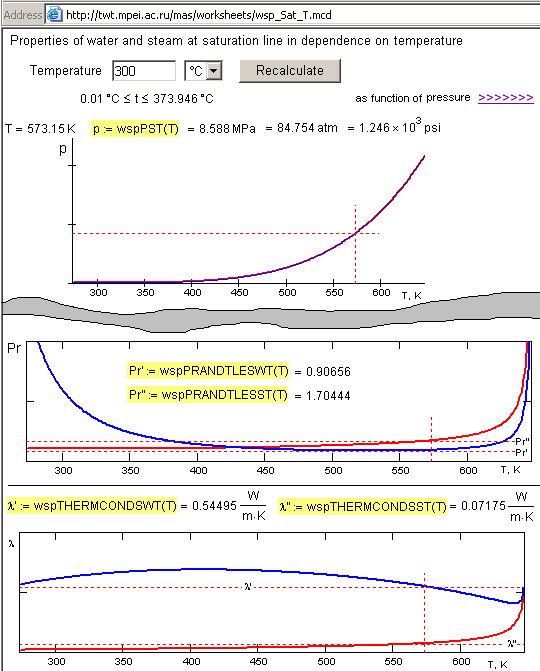 The entered data here are pressure P and temperature t. Other combinations of the data are realized on similar sites: (wsp_PH.mcd) – for pair pressure – enthalpy, (wsp_HS.mcd) – for enthalpy – entropy. 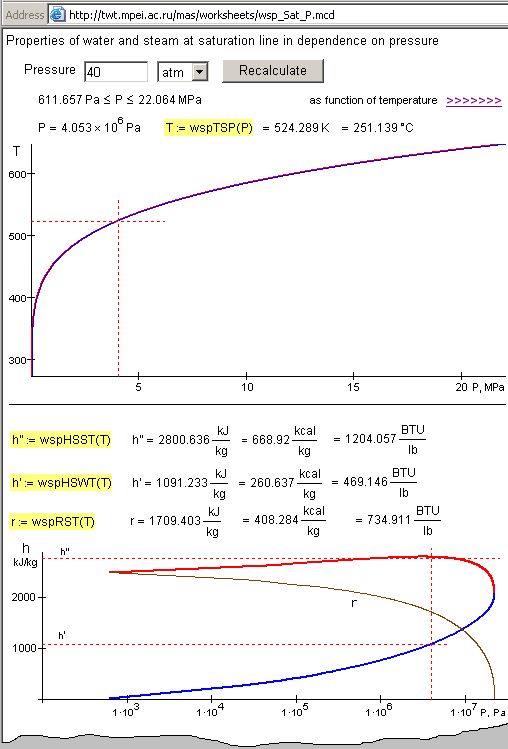 For calculations in the two-phase region there is another way to choose the input data (wsp_PT_X.mcd), see Fig. 5. The user can provide the value of pressure or temperature, choose the second parameter from the list, enter its value and the program represents value of steam quality X. Fig. 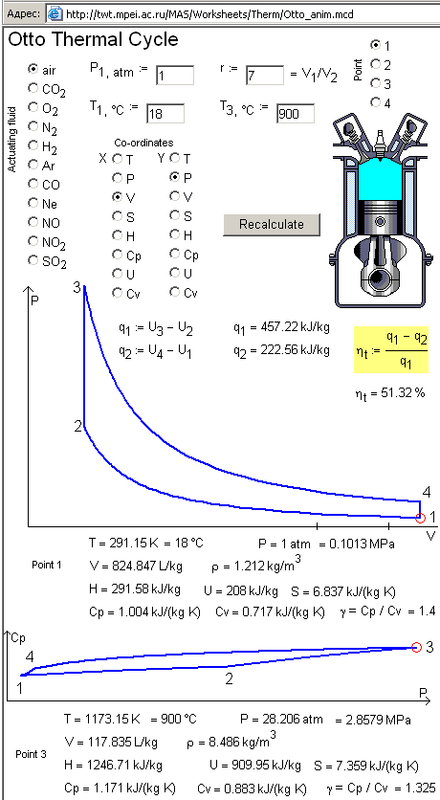 5 shows two situations: the first one –a user knows pressure of saturated steam –7Mpa –and its specific enthalpy –1700 kJ/kg; the second –if temperature -200°C-and specific entropy -3.1 kJ/(kg·K) –are given. 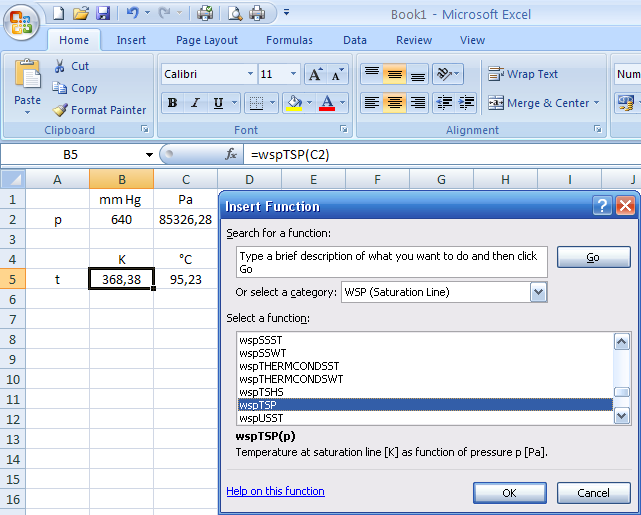 However, the most universal is the site (wsp_TextBox.mcd) shown in Fig. 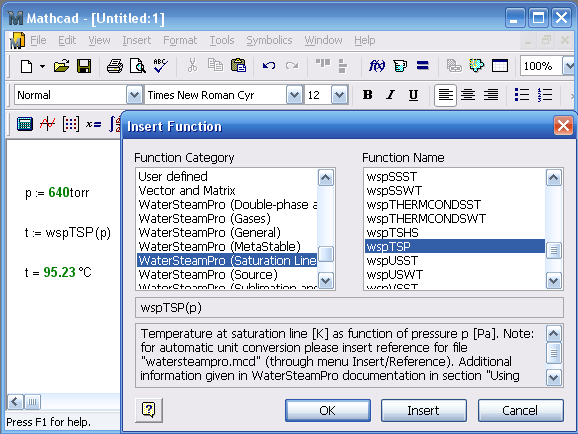 6: a user can input the function names from the program package WaterSteamPro, dimension arguments, result units, number of digits after the decimal point and by clicking the Recalculate button, he obtains the result. The functions’ names represent their arguments and the properties calculated. To work with WaterSteamPro package over the Internet and to obtain data on properties of water and steam quickly it is not necessary to input rather long addresses every time (see headlines in Figs. 1 –5). 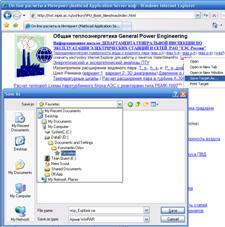 We can set the Selected menu of Internet browser (Fig. 7): manually (set the address to the required site and choose Add from the Selected menu) or follow the way shown in Fig. 8. In that case a user should download the special settings of the browser (a folder with files) from the Internet, to unarchive and save them in the folder D:\Documents and Setting\…\Selected\References. 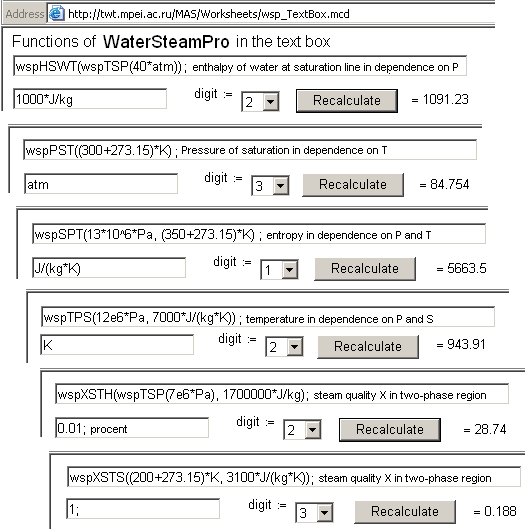 After that the user’s Selected list will contain the position Properties of water and steam (see Fig. 7) with a tree of references to sites described in this article and other information . Working with programs over the Internet has its pluses and minuses. The main disadvantage of calculation transfer from a personal computer to a server is well known: connection between the workstation and server can be broken. Besides, many computers are not connected to Internet. To provide safety, many companies disable connection to the Internet for personnel and create their own corporate Intranet. The server and sites can be installed in corporate networks and supplemented with special programs used in the company. Taking into consideration the reasons described above and some others, we provide an alternative method to access information on water and steam properties. A user can perform a one-time download of the files from the Internet or from a special CD-ROM disk (if there is no connection to the Internet). Fig. 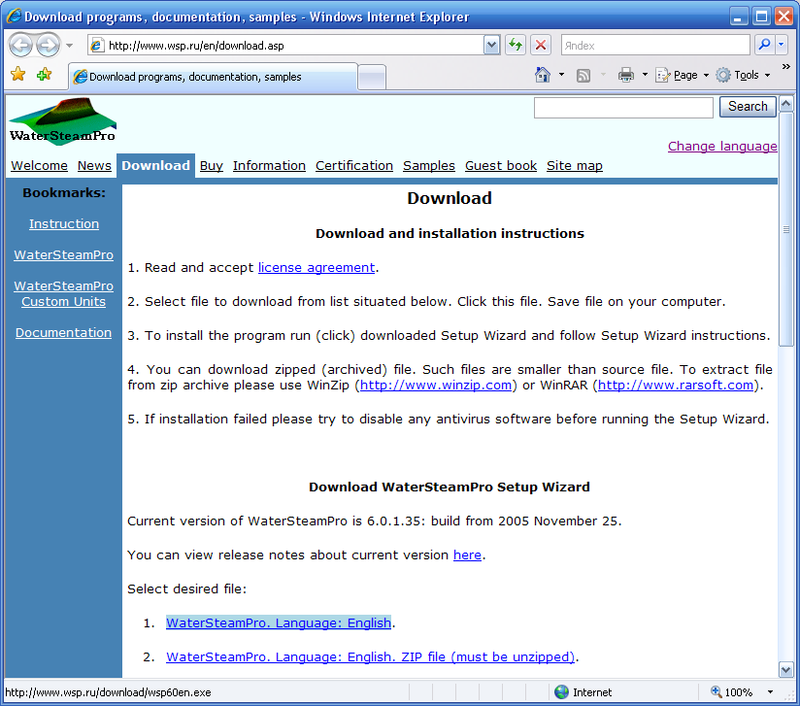 9 shows the page on the Internet (or document on disk) from which a user can download and install the WaterSteamPro version or its upgrades. 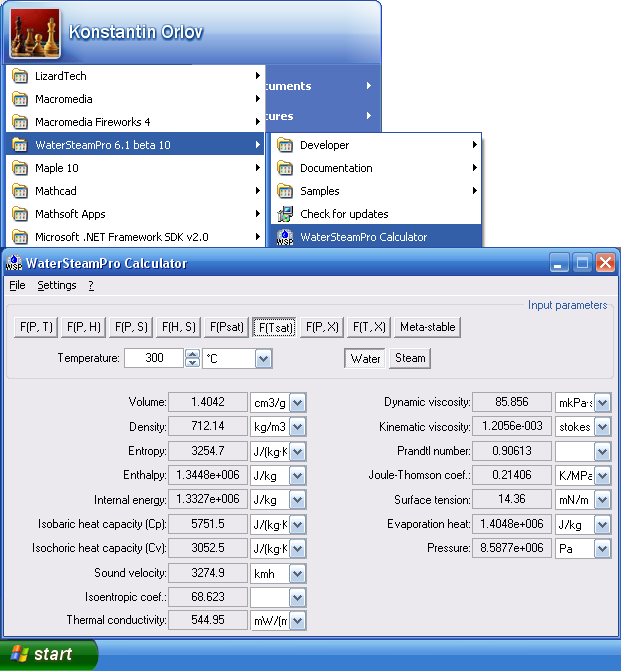 The installed WaterSteamPro package lets a user work offline with “calculator” for water and steam properties. Fig. 10 shows the “calculator” with the same example as shown in Fig. 2 (parameters of water in saturation state at t=300°C) and the way to start the calculator in operation system Windows 2000: Start\Programs\WaterSteamPro\Calculator. A user can place the calculator button on the desktop to make this application within easy reach. 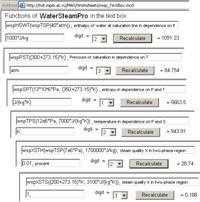 Besides, this program allows integrating the functions for calculating water and steam properties with some popular calculation systems and programming languages: Fig. 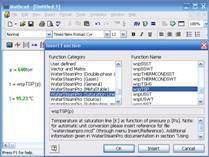 11 shows WaterSteamPro integration with Excel and Fig. 12 —with mathematical program Mathcad. Mathcad works with units automatically [7, 8]. In Excel (see Fig.11) we should manually convert auxiliary units (mm. Hg, °C etc) to basic (Pa, K etc).